Faux fur. There are few other items that can just lift your mood when you put them on. It hardly even matters what else you are wearing when you add a statement piece and a fun fur always offers that extra zing. Long, short, in pom pom, or in trim, it's just a little touch of luxe that I love. 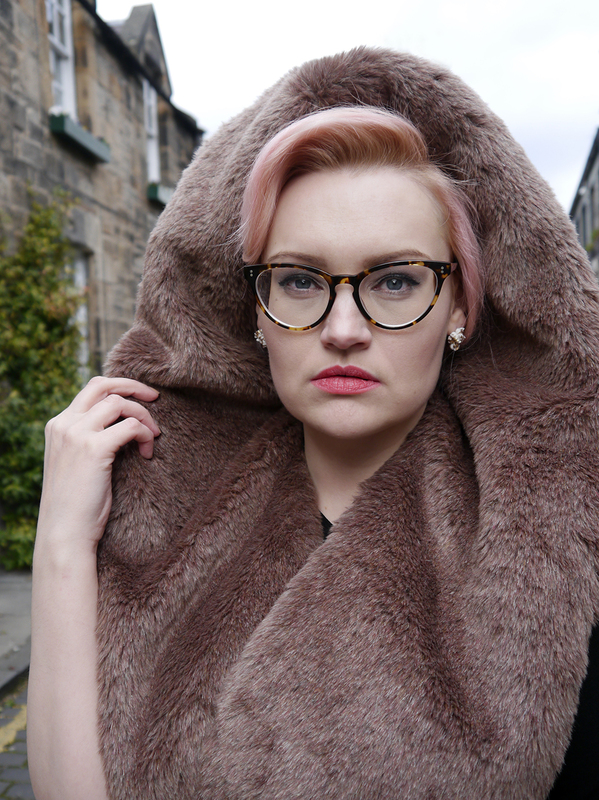 And if that faux fur can also make you look glam in rain you know you're onto a winner- a real must here in Scotland! So, of course when Helen and I heard that luxury hood makers Chouchou were in town we headed across to Glasgow to get the gossip. We caught up with #GirlBoss Silvia at her Wear Eponymous unveiling of the beautiful new Hollywood Miss West End Girl hood, created in collaboration with our girl Lynsay. The luxurious trim is the bigger faux fur I've seen in her designs and against the acid green jacquard it is glamorous to the max. Meeting the designer is always top of our list and Silvia is a real firecracker- passionate about her brand and all the ladies who buy from her. She knows her customers by name and many dropped by to see her while she was visiting from her base in Barcelona. She's a big voice online but meeting her in person gives you an insight into the work and energy she has put into honing her hoods. We had a go at styling up some new pieces (swoon!) and when Chouchou challenged us to show the versatility of their reversible Hollywood Kitty hoods we were excited to get started. The hood we're styling this week is the limited edition Hollywood Heart Kitty. I'm sorry to say it's now sold out but there are still eight other beautiful Kittys to choose from (that Hollywood Wild though?). 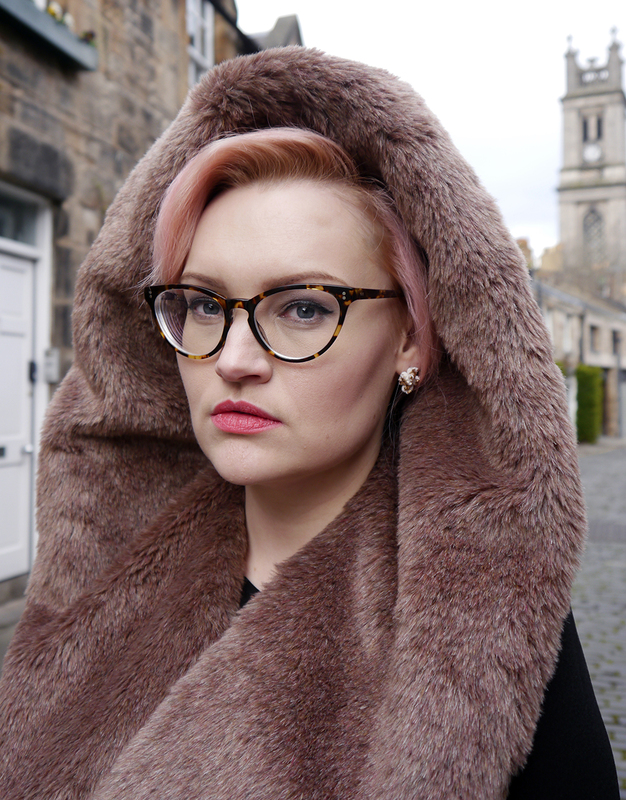 While Helen took on the fun, casual look for day time, I wanted to show off the luxury feel of the faux fur for a more dressed up evening look. 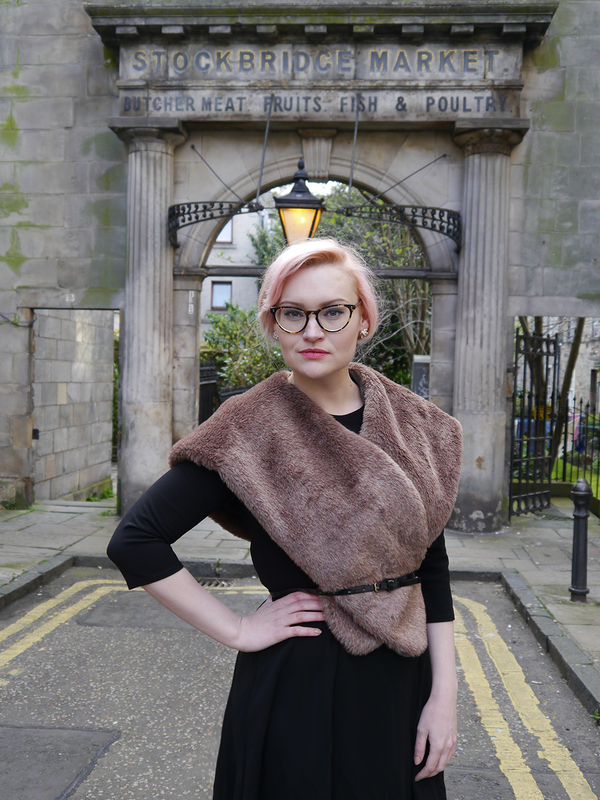 I'm a huge fan of the fluffy offerings of the Chouchou Tabarca Magic and the Lucy Cape so I reversed the super cute heart print so it's hidden in my pics (Helen is showing it off in its full glory on Friday). 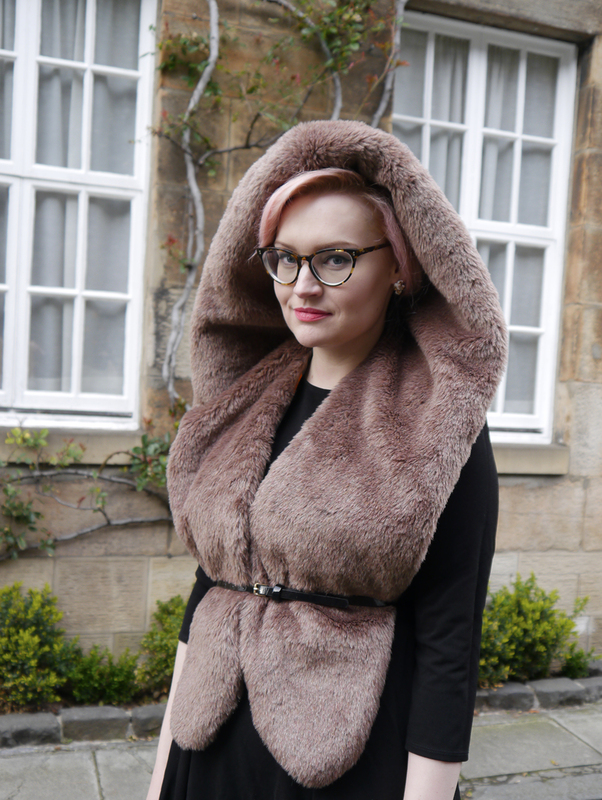 I fluffed up the hood to make it bigger and bolder, which makes it so striking as a collar against the classic LBD. I belted it at the waist in the favoured Chouchou hood girls style but also I really like it loose so I can use it like a wrap. 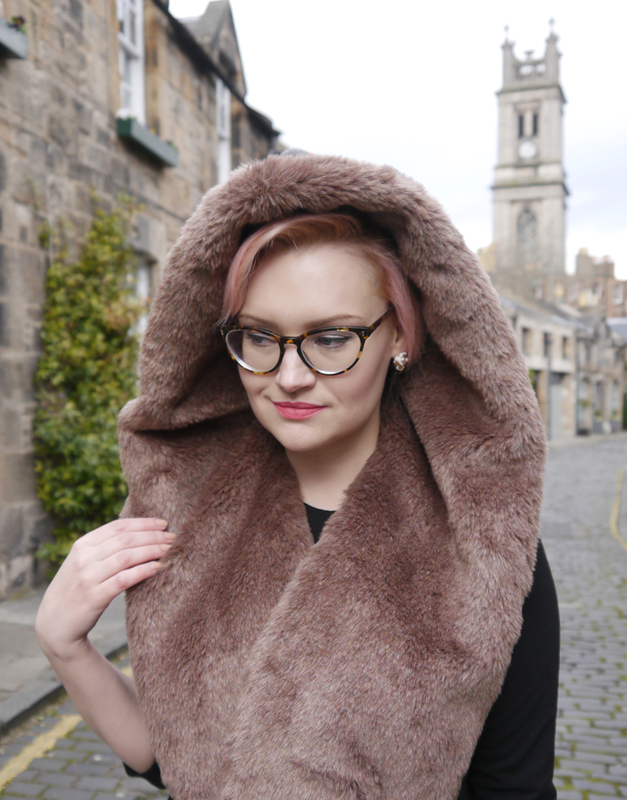 It's ideal for this changing weather and who can resist that delicious warm chocolate hue? Keeping to simple staples I've worn time and again, the hood is really the star of the show and I combined it with my other favourite accessory- my Dione Bowlt earrings. Fluffy popcorns of ceramic with gold trim, these luxury nuggets are from her graduate collection, which showed at New Designers in London 2015. They provide a little pop of fun with this chic Spring look.